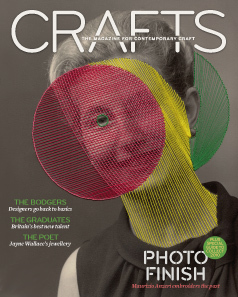 The work of artist Maurizio Anzeri came to my attention in this magazine last year, with an article written by Jessica Hemmings. And recently I found that an exhibition of his work is on at Baltic, Gateshead. I am intrigued by uses of stitch, especially when not on cloth, because I wonder what it is that drew the artist to the needle and thread rather than to the pencil, pen, etc. There is of course the added dimension of both the thread and its effect – in this case the latter being the holes caused by the needle. So is this use of needle and thread rather than pen and line adding the active dimension of piercing and pulling. 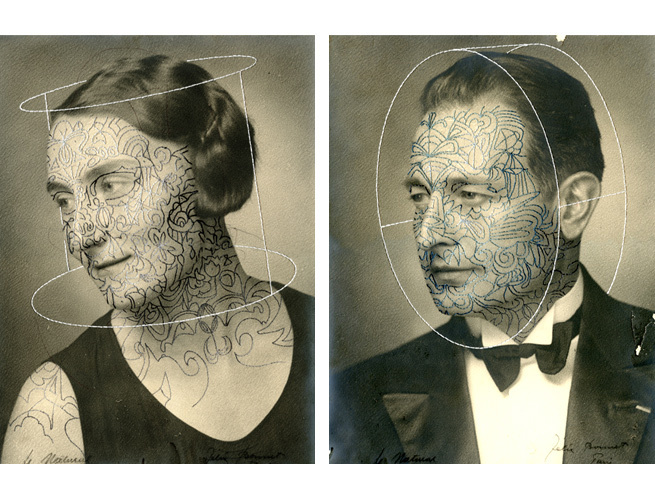 Piercings on anonymous faces from the past, and is it a drawing out of their individuality in its unknown chaotic form, pulled out to form the imposed order of the stitched pattern? And do they remind you as they do me of those so fashionable pictures made with nails and string on a dark background – when was that? To me these works by Anzeri are the dark side of stitching, somehow destructive of human sentiment because they take time, delicacy, precision, to overlay, to obliterate Taking the tradition of pattern stitching, historically used to denote cultural difference, originally used in a positive way: treasured reminders of meaningful family moments, added to the similarly important marker of the photographic portrait – from years before the constant instant snapping of today – these spirographic doodlings may be attractive in an abstracted way, but I find them fundamentally cruel in outlook. But we humans are a cruel species, and just as there is excessive sentimentality about photographs, so at the other end there is this twisting of view of what they might mean. 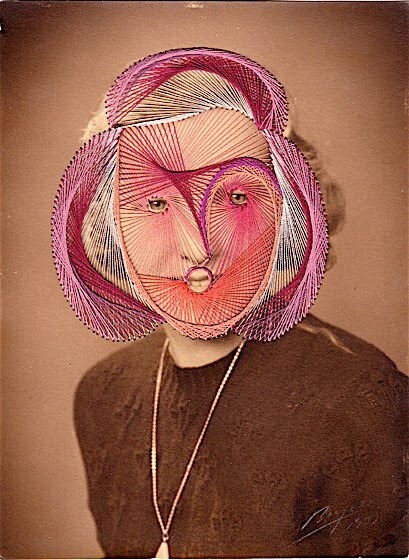 The artist Julie Cockburn also distorts found photographs, as well as sometimes embroidering on them. Is this kind of work yet another way in which an artist can say what others are feeling? That far from venerating our ancestors and their aspirations for us, their progeny, we want to impose our own patterns on them retrospectively? Is this form of art chosen because abstraction is not direct or personal enough? The abstract can be taken in whatever way the observer wishes, such as in the work of Alison Schwarz. This does not even have a title to point the viewer. 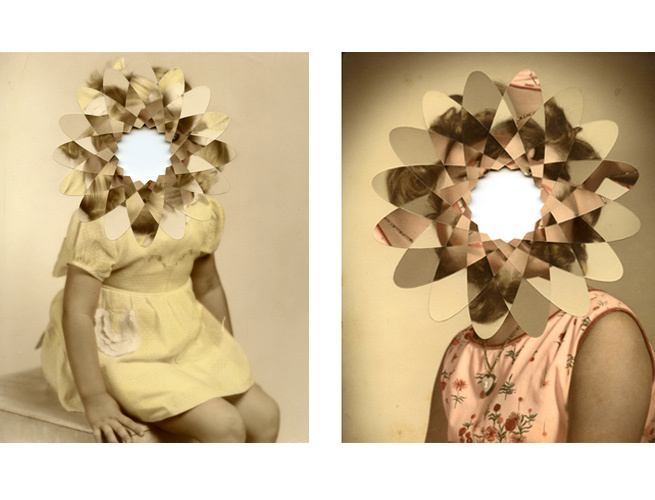 But the altered photographs link directly with every viewer in a very personal way. 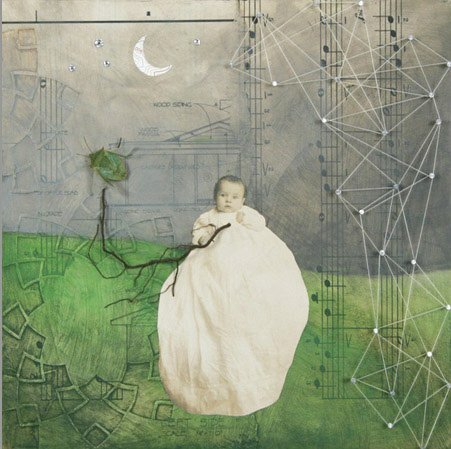 I managed to find a middle ground, using photograph and thread – although with nails this time, not specifically stitch – a use of collage/assemblage by Dayna Thacker. Do we find this more attractive/acceptable? And if we do, is it because we prefer to sugar our pills? I think that use of traditional materials, domestic skills, and use of previously highly regarded cultural markers can be incredibly powerful semiotic tools in expressing ourselves today. June, I decided to put my thinking about Eleanor McCain’s initial comments into another post. Oh, great, Olga. My workshop instructor (just finished the session) talks about the “pushback” of materials. I thought that was an interesting word. I am not very interested in why people choose to use textiles or fiber, but rather, what the strengths and weaknesses of the mediums are. Good luck. I’m still ruminating. Hi June, I did not realise it was you with an extra u. I am not in the SAQA email discussion group because it is run by Yahoo, so have not been aware of debates. I have however coincidentally been giving thought to the jurors comments at the beginning of the QN catalogue, and shall write more on that later. Nancy, it is interesting that a natural response seems to be to worry about the semi- obscuring of faces which we do not recognise even when we can see them clearly. It is the human-ness of them we don’t like losing, I guess. Ros, yes, the question of why use thread is what draws me to such uses in art, and Anzeri’s explanation has added to my further thinking about the topic which June brought up. Terry, thanks for your comment. Olga, Thank you for your thoughts and observation on the very interesting work. 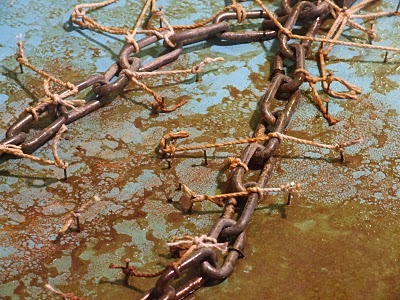 The artists have identified and used qualities and associations for these processes that aren’t always seen. The questions you raise are important and the discussion of these topics are very critical to the growth of work using textile processes and mediums. In my own art quilts, I love the feel of the fabric, even though it’s often obscured by thousands of buttons and beads. I’ve also enjoyed machine stitching on plastic sheeting with no thread, just allowing the needle to make the holes created by the programmed settings of the machine. Somehow or other, the pieces above which obliterated the faces I found to be disturbing, as faces are one of the major ways we indentify each other. While the stitches we re interesting in and of themselves, taking away the identity of the people in the photos original photos feels to me as if they never existed. Edgy! Thoughtful and impressive remarks! I tend to agree. The conversation is ongoing on the SAQA, member-only email list: someone clarified my comment a bit by simplifying the question to why a hard support (stretched canvas or masonite) worked differently from the soft (textile) support; that’s a valid question, I think, and there are others. Hi Juneu, thanks for your comment. I’m curious to know what the question posed today is, and could you link to it please -? Whew — this is powerful stuff, Olga. The images sent chills up my spine. And your comment about the delicacy and precision needed to obliterate added to my reaction. The comparisons you’ve found to include add to the intensity of each image for me. I’m posting this to FB and the SAQA list, as it addresses the precise question posed elsewhere today, and does so in a most chilling manner. Thank you for your insights and research.